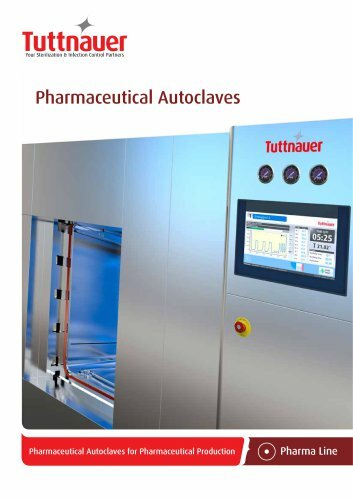 Pharma Line Pharmaceutical Autoclaves for Pharmaceutical Production Standard Optional Standard Printer Paper Chart Recorder Enables external remote access for technical support Remote Control* SCADA Software *For remote control operation with the Tablet option, a WiFi router is required. SCADA SCADA software (optional) allows for monitoring of up to 10 sterilizers from external PC workstations. The software retrieves data, creates graphs, tables and printouts. Data for tens-of-thousands of cycles & events (in HTML format) can be stored. Dashboard Real-time temperature, pressure values and graphical trends. Real-time operation of machine. In/Out Digital and Analog Status A feature for technicians to check each system component separately. Piping Diagram Includes cycle information, parameters, data, and graphical trends.